...and decide they like each other's company. 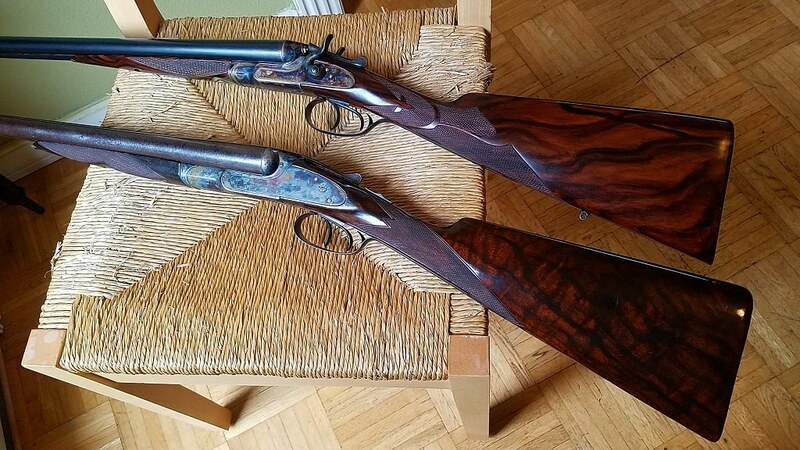 These are my two current main squeezes, an 1896 6lb 6oz special order Lefever 12ga 30" cyl/f damascus ejector gun, and my Husqvarna mod. 100 16ga hammer gun. After collecting Husky's for a while, I've been itching to have another Lefever. This one is a gun I used to own, and it was made available to me again out of the blue. It's an amazing pheasant gun. Now I just need a good boat duck gun. Maybe a Husky underlever gun?? Or a boxlock? 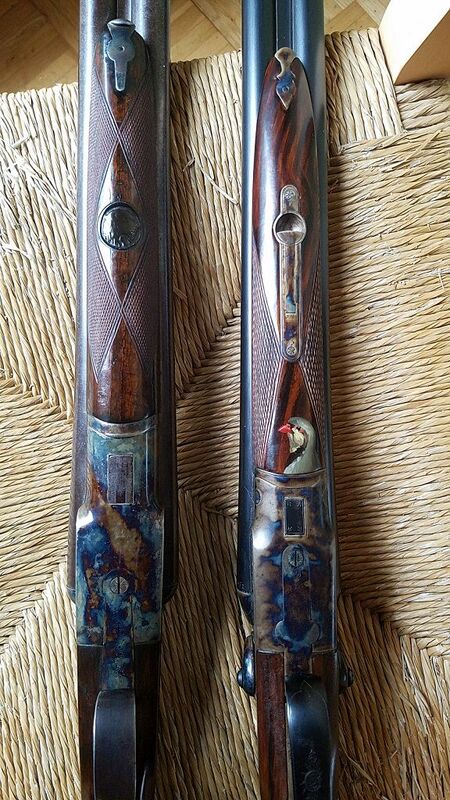 Beautiful guns for sure!! Who did the case color if I may ask?? Remarkably close to original Lefever , in my opinion anyway.. For a duck gun, how about a F grade 10ga fishhook? It most definitely came out of Syracuse as a duck gun, and needs t be a duck gun again!! Thanks. Justin at Classic Case Colors in Idaho did the case colors on the Husky. I don't remember who did the colors for the Lefever, but they are a bit too strong imo for that gun. I'm going to tone them down a bit. Your F grade 10 sounds interesting, but feeding it no tox ammo would get expensive. Quite a transformation on that Husky. Beautiful work as usual. Mark, beautiful work as always! You sure are talented. As a side note to those who may be interested, Mark has done a few of his stock enhancements for me in the past. The finish is still holding up, no issues or problems. So if you want your sows ear stock to look like a swan, Marks the guy! Location: thick and uncivilized places in the Allegheny Mts. The word talented doesn't begin to describe you. Going into coverts becomes less a chase with the sole purpose of killing; it remains important to find game but the gratification-and I keep coming back to that word-is in the beauty of finding it. George Bird Evans A Dog, A Gun, And Time Enough. Mark definitely has a Gift. I'm still wondering why the Husky walked into the bar after watching the Lefever bang into it. Nice job on the artificial graining. Along with your fantastic work, it looks like Justin does some nice case coloring.